The most deadly substances in the U.S. aren’t opioids, heroin, or cocaine. In fact, approximately 75,000 Americans die every year from a substance regularly consumed before sporting events, parties, concerts, and other occasions. Possibly due to its prevalence in U.S. culture, alcohol-related deaths are at a 35-year high. While some health experts have pointed to a potential positive impact from moderate alcohol consumption, alcohol certainly does not benefit everyone and the line between balance and excess can be hazy for some. In a society where pregaming may push people to the limit of what’s considered healthy, we asked over 1,000 Americans how much they drank before going out and why they did it. We even looked at which pregame alcohol was most likely to lead to negative experiences. Continue reading to see what we uncovered about the tradition of pregaming in the U.S. According to the National Institute on Alcohol Abuse and Alcoholism (NIAAA), low-risk drinking limits for adults are defined as no more than four drinks a day for men and no more than three drinks a day for women. However, it’s important to remember there is still some risk involved. If consumed over a short period – or in excess over the course of a week or month – what might otherwise be considered moderation could quickly turn into a dangerous level of consumption. Based on these guidelines, some Americans may find themselves quickly moving beyond low-risk drinking when pregaming. In most parts of the country, the typical adult drank an average of roughly 1.3 drinks before an event, though some Americans drank more than that. Those who’d been in a fraternity averaged closer to 1.7 drinks while pregaming, while respondents who identified as gay drank more than 1.4 drinks on average. Baby boomers, Gen Xers, and women typically drank the least – averaging roughly one drink as a part of their pregame routine. 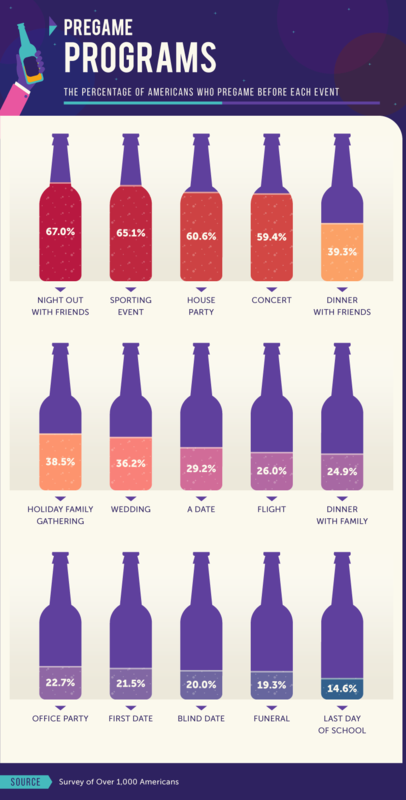 Curious which events Americans were the most likely to pregame before? It turns out social gatherings were more likely to encourage an earlier round of alcohol consumption than work functions or a date. If you’re feeling nervous before going out, whether it’s with your co-workers or a new suitor, there’s some science behind the belief that a drink might help calm your nerves – and some danger. In truth, alcohol acts as a depressant on the nervous system. If consumed too liberally, your body can also develop a tolerance to alcohol, creating more anxiety and stress as opposed to less. Over 21 percent of Americans told us they pregamed before a first date, and nearly 3 in 10 said they did it before any date at all. The most popular scenario for pregaming was a night out with friends. Whether as an attempt to save money on drinks at a club or bar or simply to enjoy a drink or two before heading out, even casual drinking can have its risks. If pregaming leads to more drinks later in the night (or even binge drinking), the potential for sexual assault, violence, or self-harm may also increase. Ever felt like you needed a drink before going out just because you wished to have a good time? You wouldn’t be alone. 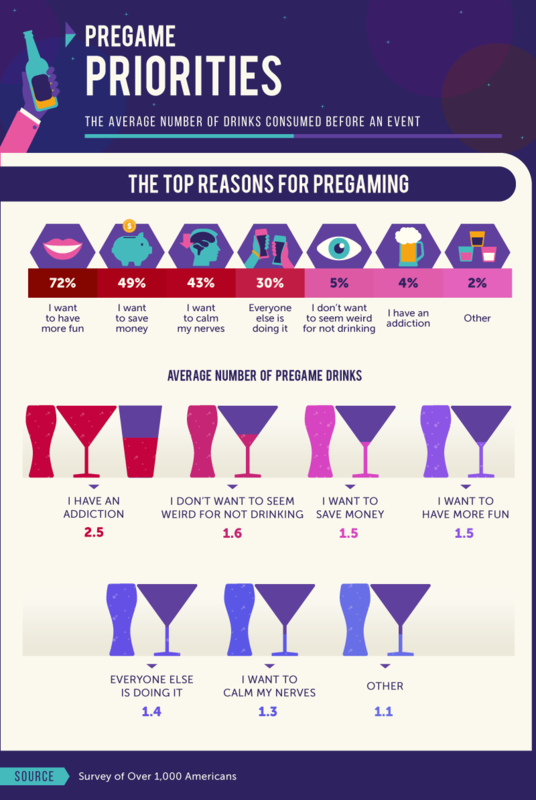 Nearly three-quarters of Americans pregamed before going out because they wanted to have more fun. In some ways, alcohol might just do the trick. Known for increasing the levels of dopamine (the “feel good” chemical) in our brains, the increase of endorphins can create the effect of joy, pleasure, and even euphoria. Drinking can also impact the prefrontal cortex and temporal lobes of the brain, which can be remarkably less enjoyable. After the euphoria fades, anger, memory loss, and fatigue may follow in its place. People who pregamed to have more fun averaged nearly 1.5 drinks before going out. Almost half of Americans surveyed pregamed to save money, and more than 2 in 5 did so to calm their nerves. While only a small percentage (5 percent) told us they drank so they didn’t stand out for not participating, those people consumed more than 1.5 drinks on average. Considering the negative effects of excessive alcohol consumption (including decreased cognitive function, changes in mood, and overall behavior), we asked Americans if they’d ever had a negative experience after pregaming. Earning a college degree might look good on your resume, but it could also increase your chances of having a bad time after drinking. Research has shown young adults in college are more likely to drink than adults the same age not attending school, to binge drink, and to qualify as heavy drinkers. According to our study, 1 in 4 Americans with a college degree admitted to having a bad experience after pregaming, compared to just 17 percent of Americans with no degree. 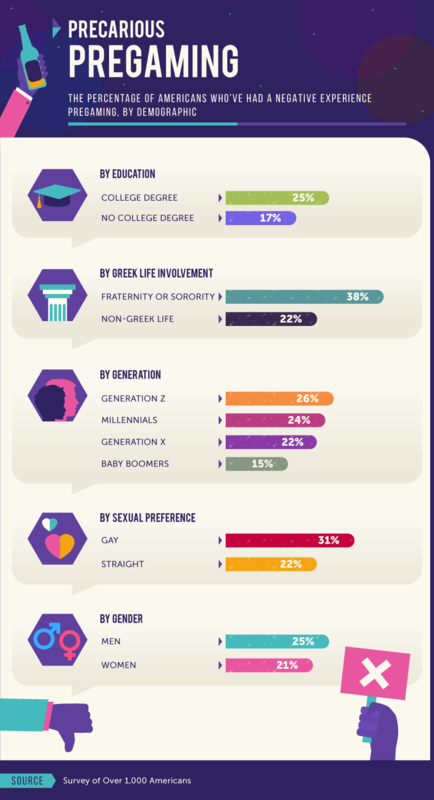 Americans who participated in a Greek letter organization (including fraternities and sororities) were even more likely to have bad experiences associated with pregaming compared to those who didn’t participate in Greek life. While the rate of alcohol consumption among students participating in these organizations may be glamorized in pop culture, research shows students in these clubs can be virtually immune to drinking interventions, despite their experiences. Bad experiences that can occur after alcohol consumption don’t always occur during pregaming activities. In reality, Americans of any age can suffer the negative consequences of even just one drink too many no matter where they happen to be at the time. The amount of alcohol a person can safely consume as low risk can vary based on the type of beverage they’re having. One glass of beer is not necessarily equivalent to one glass of wine or even one shot of tequila. How you monitor your intake should adjust based on what you drink. Americans polled indicated certain alcoholic beverages were more likely to lead to negative experiences than others. 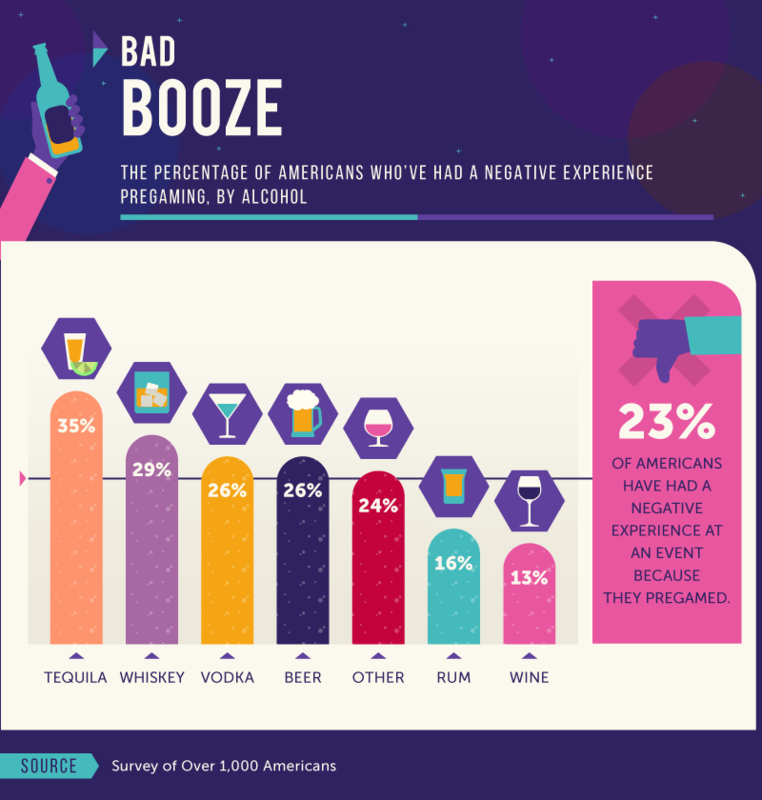 More than a third of people who’d had a negative experience pregaming said tequila was their primary beverage at the time. Whiskey (29 percent), vodka, and beer (26 percent each) followed as drinks that could be more likely to lead to poor experiences compared to drinks like wine (13 percent). Despite 26 percent of Americans indicating they’d had a negative experience after drinking too much beer before an event, more than two-thirds of men and over two-fifths of women said it was their pregame drink of choice. Beer may typically have a lower alcohol by volume concentration than wine or spirits, but it can still lead to short-term and long-term consequences including a reduced immune system, damages to sexual health, and dependency and misuse. Men surveyed almost exclusively preferred to drink beer before going out for a social event, while 1 in 5 women drank wine, and 17 percent drank vodka. Women may have told us they only had one drink on average as a part of their pregame rituals, but a single glass of wine can have three times or more the alcohol concentration of a single glass of beer. Our study found that wine was particularly popular among baby boomers and Gen Xers compared to millennials and Gen Zers. Research has also shown that the body’s ability to manage alcohol consumption also decreases as we age. While you may not have needed as much sleep when you were younger, the effect of alcohol on your sleep cycle can have more significant consequences as you get older. 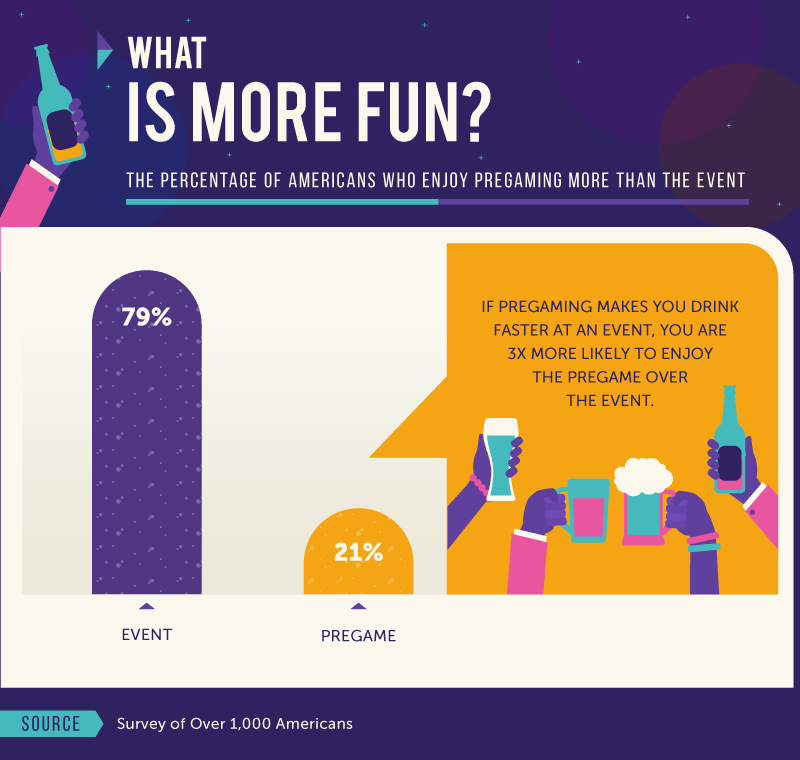 While most respondents claimed to enjoy the event more than pregaming, a concerning group of Americans enjoyed the pregame more than the event. As it turns out, the rate in which you continue to drink after the pregame has a major effect on the way you enjoy yourself later on in the day. In fact, if pregaming makes you drink faster at an event, you are three times more likely to enjoy the pregame more. In other words, it’s conceivable that the faster you drink at an event, the more likely you may be to find yourself wishing you were back at the pregame. Since the main event should really be the focus, there is perhaps a lesson to be learned here: Slow it down. Having a drink here or there may seem harmless at first. Pregaming to have more fun before going out with friends or to save money on drinks at a restaurant can feel inconsequential in the moment, but if you find yourself drinking more (or longer) than you originally intended or have too many bad experiences while drinking, you may be on the path toward an alcohol use disorder. In 2015, more than 15 million Americans over the age of 18 had an alcohol use disorder. If you or someone you love is exhibiting the signs of alcohol dependency, help is here for you. Alcohol.org can help you understand the reality of alcohol misuse, as well as provide resources for overcoming it. For people with moderate to severe alcohol dependency, withdrawal can be dangerous – making the right support structure more important than ever. We surveyed over 1,000 Americans who had consumed alcohol at some point. First, we defined pregaming as the “consumption of alcohol before an anticipated event.” We then asked each respondent which events they pregamed for most often and aggressively (regarding the number of standard drinks). Finally, we broke the respondents’ answers into demographic groupings to determine how particular groups of people in America are currently choosing to pregame.